Joseph Smith came from a devout Christian family. They did, however, call upon doctors in medical emergencies, even as they turned to prayer in times of dire need. Three emergency events became milestones in the family’s history — a typhus fever epidemic which nearly killed Joseph Smith’s sister and settled in his leg, cured through painful surgery; the death of Joseph’s oldest brother Alvin due to “bad doctoring;” and Joseph’s mother’s close call, wherein her illness was banished because of the power of prayer. Believing both in science and in the gospel of Jesus Christ, Joseph was always on the alert for ways to protect the health of his loved ones and members of the Church. “And whosoever among you are sick, and have not faith to be healed, but believe, shall be nourished with all tenderness, with herbs and mild food, and that not by the hand of an enemy” (D&C 42:43). Joseph Smith established a board of health in Nauvoo. He wanted only those truly educated in the use of herbs and medicinal treatments of the time to be allowed to use them. Having established the “Relief Society,” the womanhood organization founded by the principles of the Priesthood, Joseph wanted the sisters to be accomplished enough to administer to the sick. Joseph personally set apart in a spiritual ordination, women to serve as midwives and nurses. Miraculous healings were common among the early Latter-day Saints, and they continue to be, but Mormons also believe in science, and as science progresses, it draws closer to the eternal truths already possible to access through spiritual means. 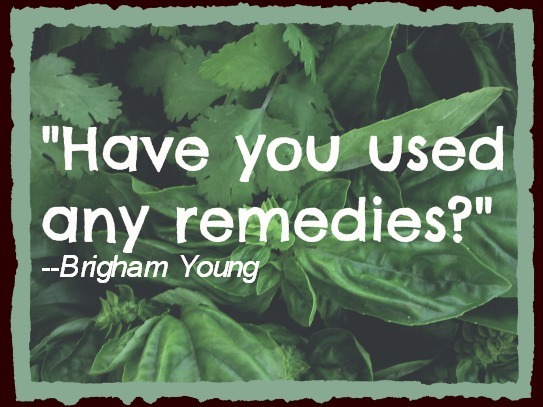 Brigham Young continued to rely on herbs and mild food in times of illness. He sent letters to the Mormon Battalion recommending the same. The U.S. Government had assigned a doctor to the Battalion who hated Mormons, a Doctor Sanderson. Prophet Brigham Young assigned an “Assistant Surgeon” from Mormon ranks, William L. McIntyre, a botanical surgeon, who also valued herbal medicine. The men of the Battalion loved and respected him. In Salt Lake City, a “Council of Health” was established, headed by Willard Richards. The council visited Antelope Island in the Great Salt Lake to gather saline plants and roots for herbal medicine. The council was active in discussing medical techniques using herbs in the region. Brigham lived during a time of great forward leaps in medicine, including modern nursing, Pasteur’s discoveries of bacteria, and the use of ether as anesthesia. In 1869 instead of commenting that the Mormons relied too much upon the Lord, he commented that the Saints relied too much upon modern medicine. It must be acknowledged that the Relief Society, the women’s organization of the Church, had been very pro-active in training women as nurses and midwives and in establishing good medical care among the Saints. The practice of plural marriage actually liberated women to go east for medical schooling because they had other women to care for their children at home. Brigham Young called a number of men and women in the Church to go east for medical education. And rather than suffer to see some corrupt Gentile practitioners come in and work their stuff upon the members of the Church, he felt that if they had to have doctors, they might as well have those of their own faith treat them. The territory had already been “blessed” with a few of those kind of the world, and he did not want any more if he could help it. (Joseph Smith and Herbal Medicine, page 93). is there a good book available about mormon folk medicine? I’m not aware of one, but it would be interesting! Anyone know?